Located in the village square opposite one of the most interesting royal palaces in Portugal. 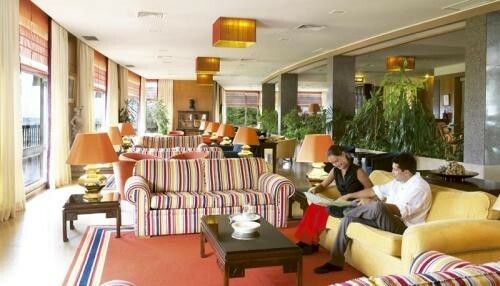 It has 77 rooms, 3 Junior Suites and one Executive Suite. Sintra is a 'must location' to visit. Discounts online. The Hotel Tivoli Sintra is located in the village square and opposite one of Portugal's most outstanding historic royal palaces - the Palácio Nacional of Sintra - with its distinctive architecture feature of two high conical structures acting as chimneys for the royal kitchen. 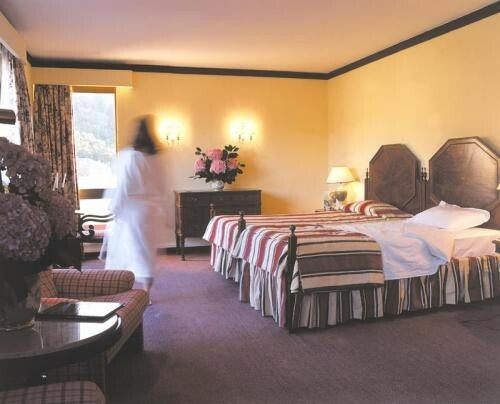 The Hotel has 77 guest Bedrooms, 3 Junior Suites and one Executive Suite. All are comfortably furnished with Satellite TV, mini-bar and Internet access. There is a Business Centre, a gym and covered parking. The 'Monserrate Restaurant' serves an international and regional cuisine with views overlooking some of the aristocratic palaces and homes which has made the village famous. Its name was chosen as a tribute to the nearby estate of Monserrate Gardens which is planted in the 19th century with many plants and trees gathered from around the world. Situated on various floors, these regionally themed rooms with spacious bathrooms have stunning views of Sintra town and the National Palace. Most rooms have a balcony or terrace affording a view of day-to-day life in the town and its narrow winding streets. A spacious room with a balcony overlooking the Sintra Valley. Features a sun lounger and comfortable garden furniture on its balcony.